Employees of the C-Tech Industrial Group are considered to be one of our most valuable assets; therefore their safety is of vital concern. Each of C-Tech’s management team has a responsibility for the safety of its employees and continually strives to make C-Tech a safe and productive place to work. All of the C-Tech companies field supervision staff has the responsibility to maintain a safe and healthy working environment on all job sites and promote safety among employees. C-Tech companies each have several safety specialists on staff, which are highly qualified and up-to-date in the ever-changing field of safety management. These safety specialists have been trained in all areas of HAZWOP, HAZCOM, OSHA and other general safety regulations, and some are even qualified to direct training classes in these areas. These safety specialists also perform safety audits on all personnel, inspect project sites for safety compliance, investigate all reported safety violations or accidents, and routinely educate all of C-Tech’s personnel on safe working habits. 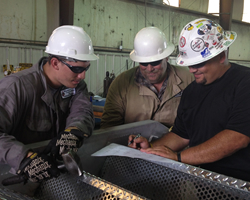 The C-Tech Industrial Group routinely holds safety-training classes and maintains a continuous education program in safety awareness and safe working procedures. All of C-Tech companies strictly enforce all mandated OSHA, Local, State, Federal, and client specific safety regulations. Operator Qualification Solutions Group (OQSG) provides full experience computer-based training and assessments to employees through the utilization of our flagship software, OQVerify™.OQVerify™ offers over 75 covered tasks, including underwater tasks. PICS was created nearly a decade ago. Now, as a renowned contractor pre-qualification company, PICS offers world-class supplier pre-qualification, with an exceptional focus on safety. National Compliance Management Service (NCMS) assists our clients, the oil & gas operators, in the contractor qualification process. We have two separate divisions within NCMS to meet the needs of this process: DOT/PHMSA and Client Required. DISA has been providing innovative workplace safety and compliance services for over 25 years. Our services are specifically designed to promote workplace health and safety, while utilizing today's most advanced technologies.